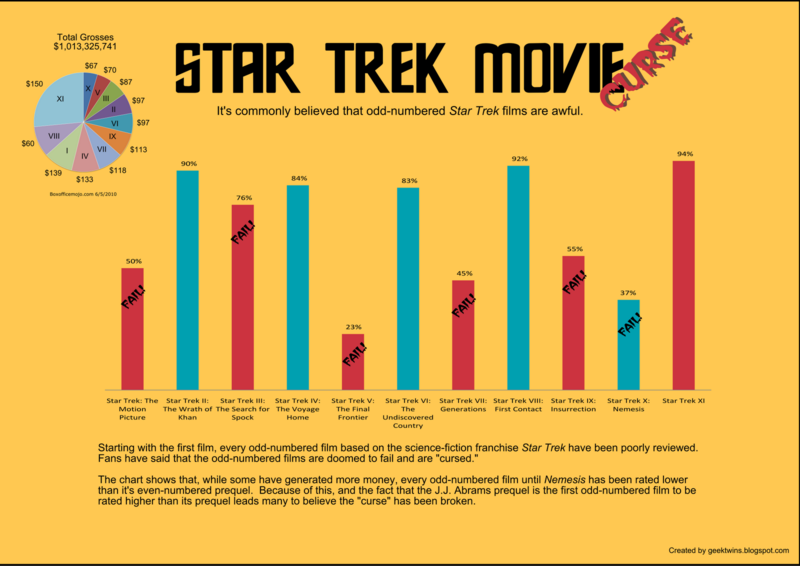 Home / Chart / Infographics / StarTrek / Infographic: The Star Trek Movie "Curse"
Simon Pegg, who went on to play Mr. Scott in the Star Trek 2008 movie, once said that every odd-numbered Star Trek film being bad was a fact of life. Is it true? This chart will answer the question. 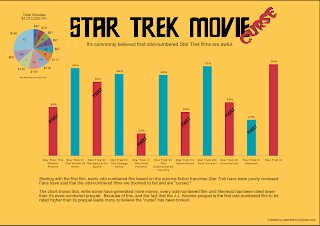 Do you think the Star Trek flms are doomed to fail? Yea, the whole odd-film myth is true! Same could be said for the Batman franchise. Could be, I repeat. Perhaps I am strange, but I truly loved Star Trek 3 and consider it the best Trek movie on many levels. We see Kirk reacting to the death of his son. We see Bones inhabited by Spock. We see Spock's father mind-melding with Kirk. We see Christopher Lloyd doing a totally amazing job portraying the evil Klingon commander. We see the incredible expression and emotion as Jim, Chekov and Scottie program the death of the Enterprise. And the ending was extremely moving as Spock's awareness of his friendship with Jim comes alive - as he becomes aware that Jim risked everything for him so that he could live again. I rest my case. You make some good points Paul. I don't agree with all the ratings myself. Nate, the numbers are taken from Rotten Tomatoes so they are an average of the critic ratings. I thought about adjusting for inflation, but thought it might get confusing. I think it's funny that ST3 ranks right up there with a lot of even numbered films (I'm assuming the percentages are critic aggregates such as rotten tomatoes?). Now are the total grosses at the top adjusted for inflation or just raw numbers? Now the real challenge: will the next "generation" (pun intended) of movies have a reverse curse (odd good - even bad) or maintain a decent level of quality throughout? Let's place our bets! Generations was good, ST2+3 were basically one film in two parts, and the new mcstar-trek film was overrated. Blog FAIL!